What Happens if you Don’t Go to the Dentist? During WWI, the US government declared oral health a threat to national security. Today, more people own smart phones than toothbrushes. While this may make it seem as though not a lot has changed, we have actually come a long way in the last century. In fact, it’s because of the oral health problems discovered in soldiers enlisting to fight in WWI that dentists focus on preventive checkups rather than reactive care. The lesson learned by examining numerous cases of severe tooth decay and gum disease in otherwise young, healthy, men is that reactive dentistry is not enough. Unlike some health issues that clear up on their own over time (the flu, cold, etc.) oral health issues typically get worse the longer they’re left untreated. At the Dental Center of Westport, we encourage patients to maintain twice a year dental visits to keep smiles healthy. Many oral health concerns are caused by plaque. Plaque is the sticky, acidic biofilm excreted by bacteria as they breakdown nutrients in food. Plaque destroys gum tissue, decays enamel, and otherwise wreaks havoc on smiles, and the longer plaque and tartar build up in one area, the more severe the damage to oral health. In fact, gum disease cannot be cured after a certain stage in its progression, and often, patients aren’t aware of the disease until it’s too late. Good at-home hygiene can only do so much. There are minute crevices in teeth that even a single toothbrush bristle cannot access, but bacteria and plaque finds their way in and cause damage over time. 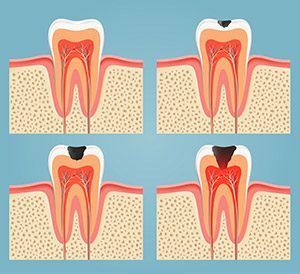 If plaque is not removed, it begins to harden and form crystals bonding with tooth enamel within 12 hours. This hardened plaque is known as dental calculus or tartar, and cannot be removed with brushing and flossing alone. Professional teeth cleanings remove stuck-on plaque and tartar from even the most hard to reach parts of teeth. These regular visits also allow our team to become familiar with patients’ smiles and diagnose and treat oral health concerns in the early stages preserving healthy, natural teeth and gums. Many of the most detrimental oral health concerns we treat at the Dental Center of Westport, have extremely subtle early warning signs, and patients don’t recognize a problem, until their oral health is already seriously compromised. Don’t take risks with your smile, contact our Westport dental team to schedule a six month checkup and teeth cleaning today. We’re dedicated to helping patients achieve and maintain the optimal level of oral health. Comments Off on What Happens if you Don’t Go to the Dentist?